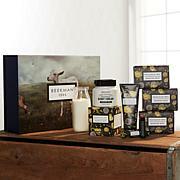 A collection of bath and beauty products formulated with goat milk and other key ingredients, with fragrance notes of sweet grass and spearmint with a hint of garden rosemary. Ingredients: Water (Aqua), Isopropyl Palmitate, Glyceryl Stearate, Cetyl Alcohol, Cetearyl Alcohol, Glycerin, Dimethicone, Caprylic/Capric Triglyceride, Fragrance (Parfum), Caprae Lac (Goat Milk), Simmondsia Chinensis (Jojoba) Seed Oil, Butyrospermum Parkii (Shea) Butter, Rosmarinus Officinalis (Rosemary) Flower Oil, Aloe Barbadensis (Aloe Vera) Leaf Extract, Tocopheryl Acetate (Vitamin E), Carbomer, Ethylhexylglycerin, Aminomethyl Propanol, Phenoxyethanol. Ingredients: Water (Aqua), Glycerin, Cocos Nucifera (Coconut) Oil, Elaeis Guineensis (Palm) Oil, Stearic Acid, Ethylhexyl Palmitate, Sodium Stearate, Stearyl Alcohol, Dimethicone, Fragrance (Parfum), Mangifera Indica (Mango) Seed Butter, Theobroma Cacao Seed (Cocoa) Butter, Persea Gratissima (Avocado) Oil, Butyrospermum Parkii (Shea) Butter, Argania Spinosa Kernel (Argan) Oil, Rosa Canina (Rose Hip) Seed Extract, Aloe Barbadensis Leaf Juice, Caprae Lac (Goat Milk), Camellia Sinensis (Green Tea) Leaf Extract, Vitis Vinifera (Grape) Seed Extract, Vaccinium Myrtillus (Bilberry) Extract, Silybum Marianum (Milk Thistle) Extract, Pinus Pinaster Bark/Bud (Maritime Pine) Extract, Gingko Biloba Extract, Tocopherol (Vitamin E), Ascorbyl Palmitate, Acrylates/C10-30 Alkyl Acrylate Crosspolymer, Ethylhexylglycerin, Phenoxyethanol, Xanthan Gum, Steareth-20, Tetrasodium EDTA, Sodium Hydroxide, Mentha Viridis (Spearmint) Leaf Oil, Rosmarinus Officinalis (Rosemary) Leaf Oil. Ingredients: Sodium Palmate, Sodium Cocoate and/or Palm Kernelate, Water (Aqua), Glycerin, Fragrance (Parfum), Caprae Lac (Goat Milk), Aleurites Moluccana Seed Extract (Kukui Nut Oil), Simmondsia Chinensis (Jojoba) Seed Oil, Butyrospermum Parkii (Shea) Butter, Sodium Chloride, Mentha Viridis (Spearmint) Leaf Oil, Rosmarinus Officinalis (Rosemary) Leaf Oil, CI 42053, CI 42090, Pentasodium Pentetate. Ingredients: Water (Aqua), Decyl Glucoside, Aloe Barbadensis (Aloe) Leaf Extract, Caprae Lac (Goat Milk), Tocopheryl Acetate (Vitamin E), Ubiquinone (CoQ10), Rosmarinus Officinalis (Rosemary), Citric Acid, Polysorbate 20, EDTA Disodium, Phenoxyethanol, Potassium Sorbate, Sodium Benzoate, Fragrance (Parfum). I've been wanting to try this scent, happy to see a set that already included our favorite things! This is very very fresh, light spearmint with the sweet grass underneath, perfect blend! 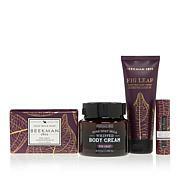 Summer is almost here, share the love with Beekman! I also ordered the oak moss set for my bf, for his assortment of everything! 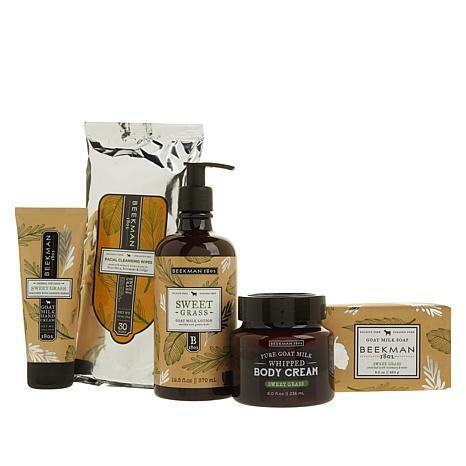 As a note, I store our products in the bounty boxes, be it soap, hand cream, body cream, face wipes, we love it all! Definitely give sweet grass a try! Thanks BB and HSN, God bless! !